RESOLVED – Microsoft OneDrive and Search Indexer 30% CPU ALL THE TIME and OneDrive stuck saying “Checking for changes” in the systray! It took me a while but I finally figured out why I was having problems with OneDrive. Scroll to the 10/05/2014 section for a description of what the problem was. I love the band Tool and one of their albums is named Ænema. It was the Æ in the folder name that caused all of these problems. Once I renamed that folder from Ænema to AEnima instantly my systray icon went from checking for changes changed to files are up to date, the OneDrive process dropped to 0%, the Microsoft Windows Search Indexer process dropped to 0%, and SkyDrive.exe stopped rapidly reading and writing multiple .etl files. Now I have my battery life back. Recently Microsoft bumped up their OneDrive space to 1TB for all Office 365 Home Premium subscriptions. 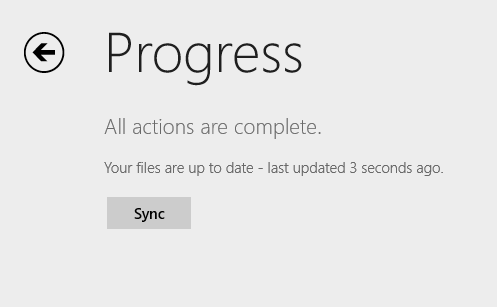 I’ve been using OneDrive to sync all my documents and software without any problems for a very long time now. I thought that I now have a Terabyte that I’ll move all of my music and videos to the cloud. My plan was to move about 10GB at a time and babysit it. If I moved all 150GB then my other documents wouldn’t get synced until all 150GB gets uploaded. Things were going well for a while. I would move about 10Gb of data into my OneDrive folder and in a day or so the icon in my systray would say everything is up to date. At that point I would move 10 more GB and wait another day. Eventually at a certain point the OneDrive icon in my systray got stuck at Checking for changes, my disk was going non-stop, my CPU was always at 30% or higher, and my notebook fan was always running even though files are getting synced with the cloud. I’ve done all of the troubleshooting steps found at http://answers.microsoft.com/en-us/onedrive/forum/sdfiles-sdsync/how-do-i-troubleshoot-uploading-downloading-and/8569cc0b-4d23-4db0-b9e9-98fe12785e5a with no luck. I’ve even reset my index with no luck. As of this day my CPU is always running at 30% between OneDrive and Search Indexer, my disk is always going, and my fan is always spinning to cool my notebook thus bringing down my battery life. I’d understand if OneDrive.exe was actually touching files that is was syncing but it appears it’s just reading and writing some etl files buried in the OneDrive application setting folder that I’m not syncing. What’s even stranger is my OneDrive app says everything is up to date and it is. Everything is getting uploaded to the cloud that’s in my local OneDrive folder. Right now I have to pause OneDrive and disable and stop the Windows Search service when I’m running on battery to increase my battery life. I don’t know what’s wrong but hopefully either I’ll figure out how to fix it soon or it might just magically start working in the future. I’m tired of having a notebook that had 4 hours of battery life go down to 2.5/3 hours because OneDrive is constantly reading and writing these etl files along with Search Indexer constantly going even though everything is syncing. IF I figure this out I’ll make sure to update the blog. Posted on October 5, 2014 Categories Microsoft OneDrive1 Comment on RESOLVED – Microsoft OneDrive and Search Indexer 30% CPU ALL THE TIME and OneDrive stuck saying “Checking for changes” in the systray! Redeem your Bing reward credits for 100GB of OneDrive storage for a measly 100 credits! I have 787 Bing reward credits and was going to redeem some of them for a $5 Starbucks or $5 Amazon card. Normally a $5 card is about 475 Bing Reward credits but I noticed an option for 100GB of storage on OneDrive for only 100 credits. 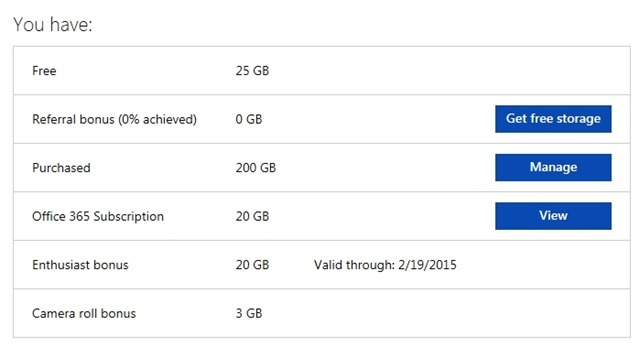 100GB of storage on OneDrive retails for $50 so if you ask me that’s a deal. Unfortunately I can’t use it as I already purchased the largest storage plan available but I wanted to share this with everyone. If you want to redeem this offer you have until June 30, 2014. Posted on April 2, 2014 March 30, 2019 Categories Microsoft Bing, Microsoft OneDriveLeave a comment on Redeem your Bing reward credits for 100GB of OneDrive storage for a measly 100 credits!